Poulter finds something at the seventh in a match that is swaying back and forth in the wind. McDowell has two putts to move 2-up with three to play. What a hammer blow that is to American hopes, a match that looked in the bag when Spieth was 3-up after five. What an unbelievable shot! That did well to even hit the green, never mind anything else, and he's within gimme distance! "A little bit of Seve for you," he says as he walks along the fairway. Rose in trouble at the 13th, he'll have to play gently from a bush under a tree... or will he! ... as does Stenson. This is a prizefight breaking out from a golf match. Stenson, ice cool, is glaring at Reed as they walk off. Graeme McDowell's incredible comeback is about to get even better. He's on the green and Jordan Spieth is struggling in the rough. Henrik Stenson has an eagle putt at the par-4, but that's not quite strong enough. 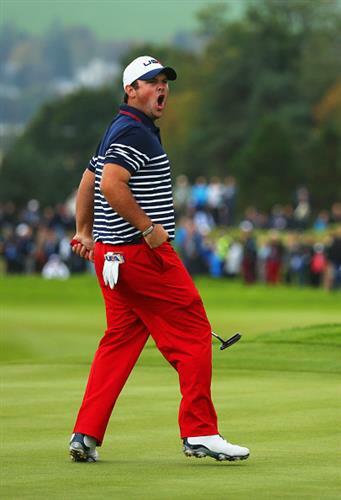 He should be good for birdie and Patrick Reed will have a putt for the halve. Why of course! It's Sunday, isn't it? And with that, I hand you back to Steven. Another square sausage sarnie, Steven? McIlroy MUST have tickets for the NFL at Wembley. He's dormie five. Gallacher straight in the middle of the cup - that's all square with Phil. Oh Justin. Shirks a four-footer and Mahan goes one up. Gallacher sends one in close to the flag at 11 to put the pressure on Mickelson's putt...and Leftie fluffed a few from that range on Friday afternoon. McIlroy is playing absolutely out of this world. Drive at 13 right down the middle and an approach within 10 feet of the flag. G-Mac finishes his putt and remains one up. That first point will be a crucial one..
Spieth makes it. McDowell facing a four-footer to halve. Slightly further from the pin than McDowell's chip. Poulter has found magic again with a wonderful approach at seven. G-Mac is lathered in momentum at the moment. Bradley misses a fluffer to halve the hole against Donaldson - Europe one up there after five. Garcia misses a similar fluffer at seven - Furyk now one up in that one. Webb Simpson has gone one up again on Poulter at six. KUCH! Kuchar holes out from some 150-yards at the eighth and is now 3-up on Bjorn. Oh Rory. That is magic putting. Dribbles in at 12. Fowler follows and the Northern Irishman remains four up. Justin Rose's superb approach is enough as Mahan misses his putt - that's all square. G-Mac takes the two putt to go one up against Spieth. Fowler from the fairway at 12 - perfect weight on the approach. Seven feet from the pin. Here comes Rory...right over the top of it! Not much in that one. Spieth out of the bunker and facing a tricky chip at 13 - he goes eight feet or so past it and G-Mac now has two putts to win the hole. And go ahead. Reed is pumped to the max. More cries of "USA! USA!" as he birdies the 12th to go to two up on Stenson. Justin Rose, meanwhile, has played a fantastic iron from the fairway at 11 and is a foot from the pin. If that. As it stands, USA are on 7.5 points in the singles. Remember, they need 8.5 for victory here at Gleneagles. As Sir Alex Ferguson is Team Europe's Mr Motivator, squeaky bum time...? Rose birdies the seventh, but it's only good for a halve. He remains 4-down. Jamie Donaldson and Keegan Bradley halve the first. Only two matches left to tee off now. Thomas Bjorn wins the third against Matt Kuchar, and that match is back to all square. Mickelson hits a great tee shot at the par-3 sixth. That could be a birdie. Pressure on Gallacher to respond. McIlroy finds the bunker at the eighth and Fowler finds the green. He couldn't, could he? Bubba's hit a good one into the fifth, but Kaymer matches it and that looks like being halved. McDowell gets a bit lucky at the ninth, just flying the bunker at the front of the green. That hole has been attackable in two for much of this week, but seems like a genuine par-5 today. Martin Kaymer has taken another hole off Bubba Watson - he's 2-up through four. Good reply from Mahan, who is looking to maintain a four-hole lead. Justin Rose trying to fight back against Hunter Mahan. A great approach to the seventh sets up a birdie chance. Phil Mickelson finally gets something going - holing a fine putt on the fifth to level things against Stephen Gallacher. And now Reed holes out - he leads Stenson by one. Ian Poulter with a putt for the halve at the first, from four feet - and it lips out! He's 1-down after one to Webb Simpson. Stenson can't hole his putt on the eighth, leaving Reed a putt for the win and the lead.